A 58-year-old man presented with altered mental status. He had hepatitis C and alcohol-related cirrhosis with a Model for End Stage Liver Disease score of 17, Child-Pugh score of A6, and Westhaven grade 2 encephalopahy with hyperammonemia (240 mcmol/L) despite standard medical therapy. A CT scan of the abdomen demonstrated cirrhosis, chronic portal vein thrombosis, and a porto-systemic (PS) shunt from the IMV to right IIV measuring up to 18 mm (Figure 1A). A mesenteric arteriogram to evaluate flow dynamics demonstrated chronic PVT with flow primarily through the PS shunt (Figure 1B). Conventional TIPS was unsuccessful due to chronic PVT. The splenic vein was accessed via transsplenic US-guided needle puncture and a 5Fr-10cm vascular sheath was placed. The right portal vein was then accessed with a hydrophilic 0.035” wire and 5Fr angiographic catheter. 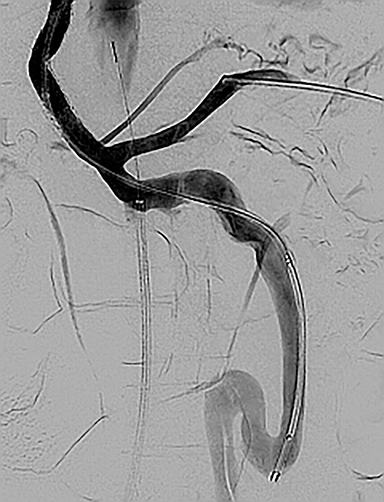 This was exchanged for a 5mm balloon catheter, which was insufflated with air so as to be visible on intravascular ultrasound (IVUS) that was positioned in the IVC from a right femoral vein approach. A Colapinto needle was advanced from the middle hepatic vein via transjugular access to puncture the echogenic balloon under IVUS guidance. A guidewire was advanced through the Colapinto needle into the main portal vein and the balloon was removed through the splenic access. A 10mm × 80mm × 20mm Viatorr stent graft was placed and dilated to 8mm. 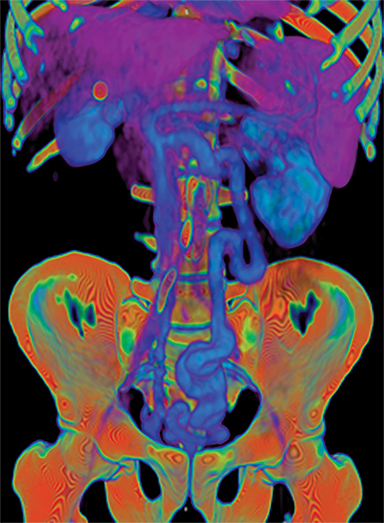 Post-TIPS portal venography demonstrated persistent filling of the IMV-IIV shunt (Figure 1C). The shunt was occluded with an 18mm vascular plug. 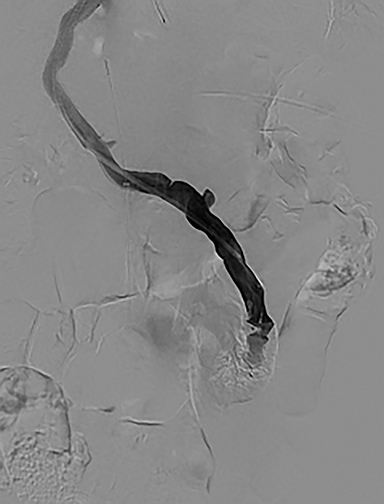 Post-embolization portal venography demonstrated a patent TIPS and occlusion of the IMV-IIV PS shunt (Figure 1D). The splenic access site was occluded with a 5 mm vascular plug. One day postprocedure, the patient’s serum ammonia level decreased to 86mcmol/L. At discharge one week later, he was without encephalopathy. One etiology for refractory hepatic encephalopathy (HE) is the presence of a portosystemic (PS) shunt. 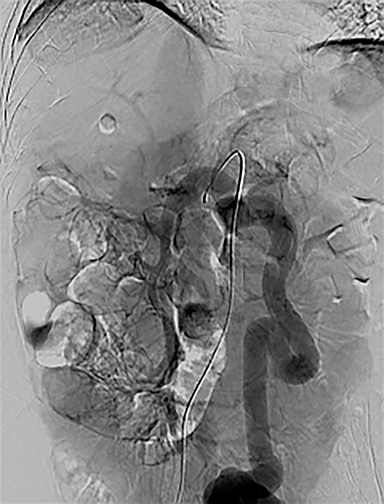 Laleman et al demonstrated safety and efficacy of PS shunt embolization for treatment of refractory HE but excluded patients with portal vein thrombosis (PVT).1 Intagliata et al demonstrated successful PS shunt occlusion for treatment of HE in a patient with PVT after anticoagulation and de novo recanalization.2 Kallini et al demonstrated the technique of trans-splenic portal vein recanalization and TIPS creation in the setting of noncirrhotic chronic portal vein thrombosis.3 This case demonstrates that refractory HE from a large PS shunt can be treated in the setting of chronic portal vein thrombosis using a trans-splenic approach to facilitate TIPS creation followed by shunt occlusion and can result in at least early improvement of encephalopathy. Laleman W, Simon-Talero M, Maleux G, et al. Embolization of large spontaneous portosystemic shunts for refractory hepatic encephalopathy: a multicenter survey on safety and efficacy. Hepatology. 2013; 57:2448-2457. Intagliata NM, Saad WE, Caldwell SH. Effects of restoring portal flow with anticoagulation and partial splenorenal shunt embolization. Hepatology. 2015; 61:1088-1090. Kallini JR, Gabr A, Kulik L. Noncirrhotic complete obliterative portal vein thrombosis: Novel management using trans-splenic transjugular intrahepatic portosystemic shunt with portal vein recanalization. Hepatology. 2016; 63:1387-1390. Reddick M, Gajera P, Sutphin P, Park H, Kalva SP. Hepatic encephalopathy. Appl Radiol. 2018;47(9):36-37. Prepared by Dr. Reddick while serving as Medical Director of the Interventional Radiology and Special Procedures Clinic at Parkland Memorial Hospital, and Associate Program Director of the Diagnostic Radiology Residency; Dr. Gajera while a PGY 1 Diagnostic Radiology resident; Dr. Sutphin and Dr. Park while Assistant Professors of Radiology; and Dr. Kalva while an Associate Professor of Radiology and Section Chief of the Interventional Radiology and Special Procedures Clinic, all at UT Southwestern Medical Center, Dallas, TX.